While every week it seems as though a new study touts a breakthrough superfood, James Wong, a botanist trained at the Kew Royal Botanic Gardens in London, points out that the science really hasn’t changed much over the decades. 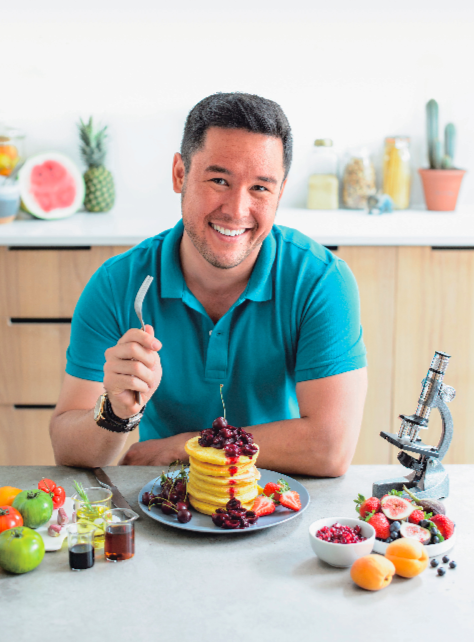 According to the co-host of the PBS show “Delicious Science,” the advice remains the same: Eat lots of fruits and veggies, and ease up on red meat, fat, and sugar. 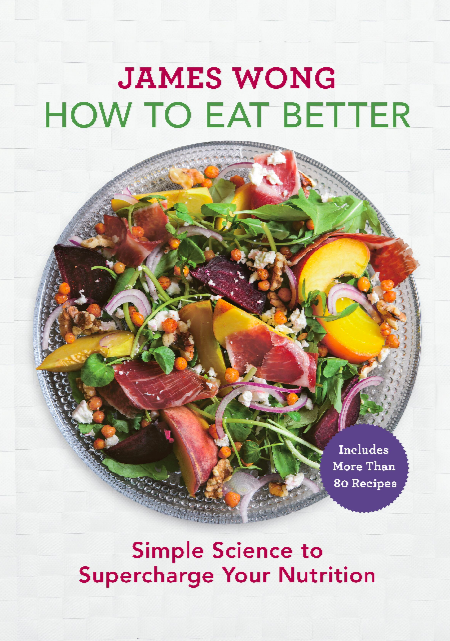 In his recently released cookbook, “How to Eat Better: Simple Science to Supercharge Your Nutrition” ($24.95), Wong adds to the conversation by explaining how you can boost the nutrients in your food through some simple tips for selecting, storing, and cooking. He isn’t one for fads; he’s aghast at calling spiralized vegetable noodles “pasta,” for example. His advice is based on combing through 3,000 scientific studies, rather than advocating for the latest headline-making miracle food of the moment. Some of the advice is compellingly easy to follow and starts at the grocery store. Wong lists different varieties of produce, ranking them from most nutritious to least nutritious. Pick the more nutrient-packed Braeburn over Fuji apples, for example, or Hokkaido over acorn squash, and you’ll already be ahead of the game. Once at home, too, how vegetables or fruits are stored makes a difference in their nutrient content. Put mushrooms on a windowsill where they can soak up the sun for an hour or two, and the reaction to UV light will make them produce a significant amount of vitamin D.
Wong notes a Penn State study in which a serving of white button mushrooms, exposed to UV lamps for one second, went from containing practically zero vitamin D to a whopping 824 percent of the daily recommended intake. The same experiment repeated with shiitake and oyster mushrooms resulted in vitamin D content over 1,000 times the daily recommended intake. Some of the scientific evidence backs up old kitchen wisdom. You’ve probably heard advice against storing tomatoes in the fridge, and how this makes the tomatoes taste bland. It turns out that once tomatoes have been picked, they will start becoming redder and producing an antioxidant called lycopene, but that only happens if they are stored above 50 degrees Fahrenheit. Not only that, but to access the lycopene content—and to turn them into a soluble form that’s easier for the body to absorb—just simmer for 30 minutes. This will yield twice the amount of the antioxidant. And researchers at Deakin University in Australia found that adding 1 tablespoon of olive oil for every 10.5 ounces of cooked tomatoes made lycopene in the study participants’ blood rise to almost three times the amount over eating the same quantity of tomatoes without the oil. Finally, what about adding a little cheese? A Journal of Nutrition study cited by Wong found that consuming tomato extract with milk protein also made lycopene more easily absorbed by the body. Those Italian grandmothers sure knew what they were doing. Some diets focus on raw foods, but Wong points out that many foods actually yield more nutrients in their cooked state. Blueberries, made into a compote, yield 100 percent more antioxidants. Spinach, once heated, yields triple the vitamin A levels over its raw counterpart—not to mention that you’re likely to eat a larger serving when it’s cooked rather than raw. Carrots, bell peppers, winter squashes, and a wide variety of crops offer a nutrient boost after cooking, as well. Wong also takes on some commonly held assumptions, even including eating locally and in season. For example, local has long been preached as a cornerstone of healthy eating, but Wong takes a more nuanced approach. Not all crops are created equal, he argues, and tomatoes grown in the Mediterranean are more nutritious than ones grown in colder climes. And as carbohydrates continue to be derided, Wong points out that diets based on complex carbohydrates have been around for thousands of years longer than modern afflictions such as soaring obesity rates and diabetes. Take the humble potato, for example, which has gotten a bad rap. It turns out that studies have not found a consistent link between potatoes and weight gain, and instead show they can decrease blood pressure and calm inflammation. Not only that, but potatoes, ounce for ounce, have fewer calories than almost any other source of starch—50 percent fewer than pasta and 70 percent less than white bread. Wong does recommend some varieties over others: purples ones, which have more antioxidants; and small ones, which have a higher skin to surface area ratio, as the skin contains beneficial polyphenols. It’s but one of many boons for the lazy (or perhaps it’s more accurate to say efficient) cook, who doesn’t want to be bothered to peel, that that advice extends to many items, like apples. Not only is half of an apple’s fiber found in the skin, but so are half of its antioxidants. There are some 80 recipes in the cookbook, including delicious savory scallion-mashed potato pancakes paired with poached eggs and pickled onions, or a sweet potato pie made with the orange and purple varieties (see recipes that follow). The real gems, though, are the lessons that Wong imparts about the plant world and human nutrition. These were one of my favorite lazy Sunday breakfast dishes when growing up and visiting my family in Malaysia. OK, the real deal is made with Chinese chives, but scallions work just as well in this shamelessly Westernized recipe. Once cooked, the flavor mellows to a delicate, sweet richness to create irresistible savory pancakes that are nearly 50 percent vegetable. Place all the ingredients in a large bowl and season with salt and pepper, then stir until loosely combined. Grease a large skillet with oil and heat until hot, then pour spoonfuls of the chunky batter into the skillet to make small pancakes the size of a CD. Fry for about 1 minute on each side until cooked through. Remove from the pan and keep warm in a low oven until all the pancakes are made. 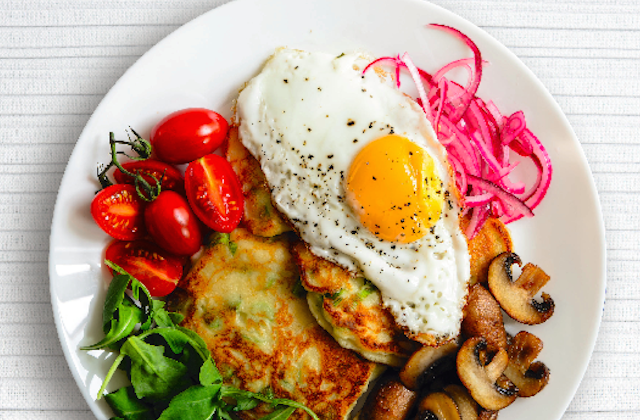 Serve each portion of pancakes with cherry tomatoes, a fried egg, grilled mushrooms, a handful of arugula, and some Pink Pickled Onions With Lime and Bay Leaves. The green leafy bits of scallions, and leeks for that matter, contain quadruple the beneficial compounds of the white stem, according to researchers at the University of Life Sciences in Lublin, Poland. Yet these are precisely the bits most people end up throwing in the garbage. Don’t overpeel and you will instantly boost nutrition. Place all ingredients in a nonmetallic bowl and toss together. Cover and let infuse in the fridge for at least 30 minutes or preferably overnight. Use when infused or store the pickled onions in a sterilized jar in the fridge for up to 3 months. Onions seem to be forever a “supporting cast” ingredient in dishes, but this shouldn’t be the case! 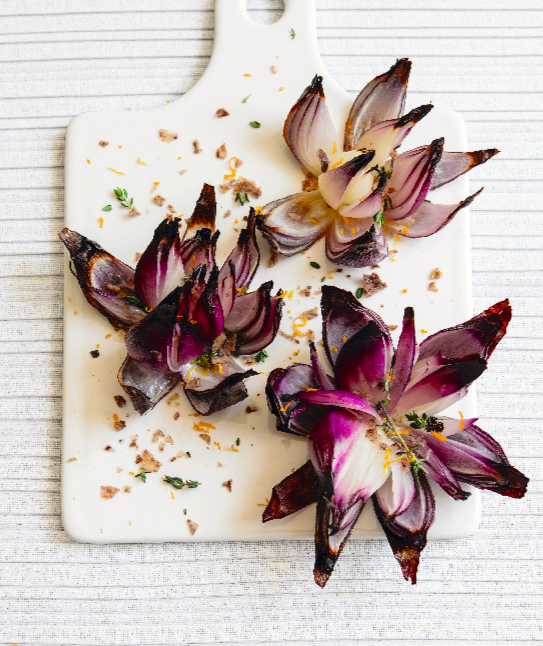 Simple, beautiful, and delicious, these roasted red onion “flowers” will steal the show at any meal. Slice the onions down the center into quarters or eighths, keeping intact the bottom 1/2 inch of the bulb where the roots grow from. Arrange the onions in an ovenproof dish, brush with the oil, and sprinkle with the salt and thyme. Bake for 40 minutes until golden and tender. Scatter the onion “flowers” with extra thyme and the orange zest, and serve. Sticky sweet, an amazing color, and made with over 50 percent fruit, vegetables, and nuts, this is my nutrient-dense, no-added-sugar take on the soul-food classic. I am way too lazy to spend hours rolling out pastry, so I have concocted a super-easy crust using little more than sweet potatoes, coconut, and almonds that takes 5 minutes to make. Preheat the oven to 400 degrees F, and line a 10-inch pie plate with nonstick parchment paper. Make the crust: Squeeze the grated sweet potato over the sink to extract as much liquid as possible, then transfer to a bowl and combine with the remaining crust ingredients to form a dough. Press the mixture firmly into the bottom and inside of the lined pie plate. Bake for 15 to 20 minutes, or until golden. Use a spoon to further compact the crust into the sides and bottom of the pie plate, then let cool slightly. Reduce the oven temperature to 300 degrees F.
Meanwhile, make the filling: Blend all the ingredients together in a food processor until you have a smooth, velvety mixture. Pour the filling into the crust. Bake for 1 hour or until the filling is set with a very slight wobble in the center. Let the pie cool completely. 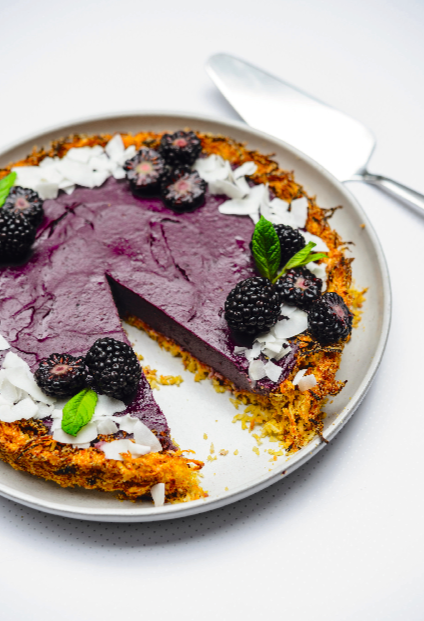 Decorate the pie with blackberries, mint leaves, and shredded coconut. Reprinted from “How to Eat Better: Simple Science to Supercharge Your Nutrition” by James Wong. Published by Sterling Epicure. Millennials Love Lettuce, Tomatoes, Apples, and … Oreo Milkshakes? Maximum impact for minimum effort is something every busy home cook can get behind. In this Ginger Beef recipe, a bold, bright sauce perfectly complements with the beef. Ali Rosen's Cherry Tomato Tart is sure to be the prettiest dish at the party. For Valentine's Day, between flowers and chocolate, the choice is clear to master chocolatier Christophe Toury. "I don’t eat flowers," he says. They’ve been called virgin drinks and mocktails, but at The Bonnie bar, in Astoria, Queens, they’re called zero-proof cocktails.